Energy saving refrigerators can take a big dent out of your utility bills. Whether you have an older fridge and are thinking of replacing it, or a newer model that you just want to get the most out of (for the least energy), I’m going to help you save electricity on your refrigeration needs. The first thing you need to know about refrigerator energy use is that your fridge uses a large share of your electricity bill. About 14% of the average American household electricity usage in 2001 was used by refrigerators (the same as for air conditioners). The second thing you should know is that the energy saving refrigerators of today are significantly more energy efficient than even those of a decade ago, so you will probably save 30% or more of the electricity a ten-year-old refrigerator uses, if you upgrade to a new energy saving refrigerator. At the same time, there are plenty of things you can do to ensure that your current refrigerator uses as little energy as possible. Energy saving refrigerators don’t all have to be brand spanking new; changes in your habits, and a little fine tuning, can go a long way to cutting your refrigeration energy use. 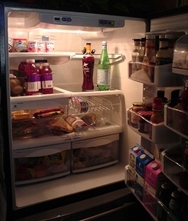 Is your current refrigerator running optimally? How much electricity does your fridge use? Unless your refrigerator is so old or worn out that you’ve already decided to replace it with an energy saving refrigerator, the first thing you should do is a simple assessment of whether the refrigerator is running well. Things like how often and for how long the compressor runs, whether there’s frost in the freezer, how good your gasket seals are, and the temperature range of the freezer and refrigerator compartments, can all effect your refrigerator energy efficiency. Start by just thinking about how often you hear the compressor motor running. Does it seem to be running all the time, or is the refrigerator mostly silent? Does the compressor seem to short cycle (short periods of activity followed by short rests)? During times of the day when the fridge door stays shut, the behavior of energy saving refrigerators is typically that of short periods with the compressor running, followed by much longer periods of the compressor resting. If that’s how your fridge operates, you’re off to a good start. If the compressor is running almost constantly, there could be issues with the seal of the door gaskets, or dust build-up on the coils, or the fridge may be in an enclosed space so that the heat the compressor is working to draw out of the interior has nowhere to go. You might just have an old fridge with an inefficient compressor, which means less heat is extracted for a given energy input, or with poor insulation, so that more heat sneaks in through the fridge walls. Or you might have set the thermostat too low in either the fridge or the freezer compartment. Next look for ice build-up in the freezer compartment. Rapid or heavy frost build-up in a manual-defrost freezer is usually a sign that warm, moist air is getting into the freezer compartment. You may have a poor seal on the freezer compartment, which allows cold air to leak out through the seal, and warm, moist air to enter in its place. It takes more energy to extract heat from moist air than from dry air, so you win on two fronts by minimizing air leaks. Even if you have a good seal, you should defrost a manual-defrost freezer regularly. You should never let more than a quarter inch of frost build up on the freezer walls, as the frost makes the compressor work harder. Check your fridge and freezer gaskets to make sure you have a good seal. The standard test is the dollar-bill test – the five-dollar bill test in Canada, since we don’t have a $1 or $2 dollar bill any more! Open the fridge or freezer door enough that you can slide a dollar bill halfway in, then close the door. If the dollar bill is held tightly in place, you have a good seal in that part of the gasket. Repeat at various other points along the gasket. If at any point the bill slides out, or feels loose, try moving the bill along the seal in each direction until it stops. That will give you an idea of how big each leak might be. You can sometimes solve gasket leaks by wiping down the gasket to remove any bits of residue that might prevent a good seal. But if there are gaps and the gasket is clean, it’s time to replace the gasket. Your fridge may pass the dollar bill test even though the gasket is letting in air – if the gasket is torn. Cracks can develop in the thin part of the gasket where it attaches to the door. So run your finger along the gasket feeling for breaks, all the way around each door. For a do-it-yourself person, gaskets can be relatively inexpensive to replace. I bought a replacement gasket for my refrigerator a few years back and with no prior instruction had it installed within a half hour. And an appliance repair person can install one even faster, especially if you tell them to bring a replacement gasket with them before they make their service call. So if your gasket is leaky or torn or too rigid to provide a good seal, replace it. The last thing to look at in your do-it-yourself refrigerator check-up is the average temperature inside both compartments of your refrigerator. You can use either a standard glass thermometer or an electronic probe thermometer to do this. Place the thermometer (or the probe portion, for an electronic thermometer) in a jar half-filled with water, and leave it in the compartment for a full 24 hours. Avoid opening the unit for at least an hour before you do your 24-hour measurement. Note the temperature of the water in the jar. For the refrigerator temperature, you should strive for 39F or 40F (or 4C). For the freezer temperature, go for 5F (or -15C). If the fridge temperature or freezer temperature is lower than this, you are wasting energy cooling your food more than necessary. Note that for chest or full upright freezers, where frozen food tends to be kept longer than in the freezer compartment of energy saving refrigerators, you should strive for a slightly lower freezer temperature of 0F or -17C. For more information see my Energy efficient freezers page. If the temperature is not at the ideal setting, adjust the thermostat in the appropriate compartment upwards or downwards by just a little. Then wait another 24 hours and take another measurement. It’s best to adjust a little at a time, until you reach the ideal fridge temperature. Once you get to that ideal setting, you can use a permanent felt pen marker to draw a line on the thermostat dial to mark which setting lines up with the stationary arrow at the front. There’s no guarantee that will always give you the ideal temperature (thermostats can be finicky) but if you later notice that the mark is far from the front, you’ll know to check the temperature again. It’s important to check your refrigerator temperature (both compartments) regularly, or at least, if you have already checked it and have marked the correct position of the thermostat dial, to check that the dial hasn’t moved. It’s easy for these dials to get turned accidentally, or on purpose by a playful child, and if the temperature varies far from the ideal settings of 40F for a refrigerator or 5F for a fridge compartment freezer, you either risk food spoilage or a higher energy bill. Energy saving refrigerators should be able to run for less than a kilowatt hour a day. The Sun Frost refrigerator – one of the most energy saving refrigerators on the market, designed for homes powered by solar electricity where buying the most energy efficient appliances is usually cheaper than installing more solar panels – uses only half a kilowatt hour a day. But even the most energy saving refrigerators for general household use today use more than a kilowatt hour per day. Unless you have already decided it’s time to upgrade and start shopping around for energy saving refrigerators, it is very worthwhile for you to measure how much electricity your fridge uses, in kilowatt hours per day. Your refrigerator could easily be costing you $30-100 a year more in electricity than it needs to, and for an investment of $20 or so you can buy a Kill A Watt meter or other home energy monitor to measure the efficiency of your unit. Once you know how much electricity your fridge uses, you can compare it to the advertised kilowatt hours per day consumption of new energy saving refrigerators, and decide if it’s time to buy a new one. You can learn more about this great meter and other home power monitors on my Kill A Watt meter page. Here’s how you can use the device to measure how much electricity your old refrigerator uses. Pull your fridge away from the wall. Unplug the fridge and plug an extension cord into the wall outlet instead. Plug the Kill A Watt meter into the other end of the extension cord, and plug the fridge into the Kill A Watt meter. Place the connected Kill A Watt meter somewhere where you can read it, and slide the fridge back into place. Of course, if you can already see the wall plug where the fridge is plugged in, you can simply unplug the fridge, plug the Kill A Watt meter into that plug, and plug the fridge into the meter. But every fridge I have measured has had its wall plug hidden behind or beside the fridge. The Kill A Watt meter measures, among other things, kilowatt hours consumed, and time elapsed. You need to let the fridge run for 3-4 days (but not more than 4, because the time elapsed wraps after 99 hours and 59 minutes! ), then take readings for both the kilowatt hours consumed, and the hours elapsed. You can see how much wattage your fridge uses if you switch the Kill A Watt meter to the Watts setting, while the compressor is running. But watts don’t really tell you much; what you want is kilowatt hours, which is a measure of how much power your fridge uses (1 kilowatt hour = 1,000 watts for one hour). Compute the kilowatt hours per day as described below. To compute kilowatt hours per day, given the time elapsed in hours and minutes, and the kilowatt hours used, follow these steps. Let’s assume we consumed 5.72 kilowatt hours in 79 hours and 24 minutes. Divide the hours by 24 to get the days. So 79.4 hours becomes 3.3 days. Divide the kilowatt hours consumed by the days elapsed. So 5.72 kwh / 3.3 days = 1.73 kilowatt hours per day. New ENERGY STAR energy saving refrigerators must exceed the minimum US Federal standard for refrigerator efficiency by at least 20%. The standard varies by refrigerator configuration, refrigeration type (CFC vs HCFC), and volume, and is based on a formula too complicated for most lay people to understand, so instead let’s look at a few sample ENERGY STAR energy saving refrigerators by size and see how much electricity these refrigerators use. The first four are top-freezer models, the last is a bottom-freezer model, and the ‘Percent Better’ column means how much more energy efficient each model is than the minimum Federal standard. Once you have established how much electricity your refrigerator uses – it should be somewhere between 400 and 600 kilowatt hours per year, depending on the size of unit, as well as energy-intensive features such as side-by-side doors, ice dispenser and cold water dispenser – you can compare it with the examples above, or with a complete list at www.energystar.gov, to see if your refrigerator is inefficient enough to warrant replacement now. Energy saving refrigerators work by extracting heat from the interior of the unit and radiating that heat outside the unit. A compressor powered by an electric motor pumps refrigerant in a closed loop, and the refrigerant changes state, from liquid to gas (which absorbs heat from inside the refrigerator), and back from gas to liquid (which releases heat to the outside). Most older refrigerators released their heat through an exposed network or rack of tubing (the ‘radiator’) on the back of the unit. Dust building up on this radiator acts as an insulator, and the more dust, the better the insulation. Unfortunately, insulation isn’t something you want here, because you want the heat to escape. So if you have one of these vintage refrigerators, you should pull the refrigerator out every month or so and remove the dust and cobwebs. Newer energy saving refrigerators typically vent through a network of tubing that is just underneath the exterior casing of the unit. Again, keeping this free of dust will improve heat exchange and reduce how much electricity your fridge uses. If the compressor itself is visible (a motor at the bottom back of the unit), vacuum it clean as well. This will make the motor run more efficiently. Inside some refrigerators, especially older models, you’ll find another network of tubing embedded in metal inside the top part of the compartment; the cooled refrigerant circulates through this metal and cools the compartment. Again, it’s best to keep this clean of any dust, dirt, mold, or mildew, as these will reduce the efficiency of the heat exchange. Finally, as mentioned earlier, if you have a manual defrost fridge, be sure to defrost it regularly. Turn the fridge off, wait a few minutes, then open the freezer door and remove any chunks of ice that have become loose. Remove the food and place in a box. Once empty and with the door open, a refrigerator freezer compartment will defrost in a matter of minutes. Sponge up the water, toss any remaining ice chunks into the sink, and dry it thoroughly, then put the food back inside and plug the fridge back in. As long as the frozen food is all kept together, and you defrost the freezer quickly, it will not warm enough to incur spoilage. Energy saving refrigerators need air to absorb the heat they extracts from inside the fridge and freezer compartments. On older fridges this heat is exchanged, as mentioned above, through a network of coils exposed behind the fridge. On newer energy saving refrigerators this network is usually embedded inside the fridge casing, at the surface outside the fridge insulation. You can test where your refrigerator heat coils are by taping an electronic probe thermometer to various points on the fridge sides and back, and seeing where it gets hot. Any part of the fridge that is warmer than the ambient air is a part that is being used to release heat. Leave gaps between the sides of the fridge and adjoining walls or cabinets. It’s probably okay to store the odd broom between the fridge and a wall, but don’t store your extra foam-board insulation there! Don’t use the top of the refrigerator for storage if the surface is ever hot – you are blocking heat from being exhausted. Don’t have heating vents or radiators or baseboard heaters close to the stove. If they are close enough to the refrigerator to warm it, move them or the refrigerator if possible. If you’re trying to have an energy efficient refrigerator, it’s important to think about the energy that went into producing your food too. If food spoils in your refrigerator because it’s improperly stored, you may not be wasting electricity running the refrigerator, but you are wasting the energy used to produce the food (and the money you paid for it). At the same time, some of the forms of food storage that lead to early spoilage also contribute to making energy saving refrigerators work harder. Any unsealed food you place in the refrigerator will lose moisture in the dry, cold air that your refrigerator is trying to maintain. For example, leafy greens will quickly wilt if left in the main compartment unbagged. It’s best to bag them and store them in the crisper. The moisture loss contributes both to early spoilage of the greens, and to an increased moisture load in the refrigerator, which translates into more work for the compressor. I am always amazed at how some people can just take the wonderfully fresh spinach, lettuce, and celery they brought home from the farmers’ market, and shove it unbagged into the fridge, where it quickly wilts, and then languishes for a week because no one wants to eat wilted greens, until it’s finally thrown in the compost bin. As with leafy greens, water will evaporate from the exposed liquid, which means more work for the compressor. Liquids such as milk will spoil faster if exposed, than if in a sealed container. Spoiled food translates into wasted energy. Liquids in unsealed containers are easily knocked over by a careless hand (or when they become hidden by other foods in front of them). You then have a major clean-up to do, which usually means leaving the fridge door open for several minutes while you clean. That translates into a lot of heat being absorbed by the air inside the fridge as well as by the foods themselves. Liquids such as milk that spoil easily can impart the unpleasant odors of their spoilage to other exposed foods such as fruits and vegetables. No one wants to eat lettuce or an apple that smells or tastes like sour milk, so these get thrown out. Thrown out food means wasted energy and money. Another way to reduce food spoilage and thereby save the energy that went into making the food, is to make sure you can tell what’s in each of the sealed containers in your fridge. Remember the four R’s of Reduce, Reuse, Recycle, and Rot (meaning compost rather than throw in the trash). These are ordered from most to least desirable, so if you can reuse leftovers, that’s better than rotting (composting) them. When you place leftovers or unused ingredients in opaque containers, it’s hard to see what’s in them, and foods get forgotten and then spoil. Use clear containers, or label the containers clearly, or better yet, do both. Don’t view that Tupperware container or re-used yogurt tub as a way to put off dealing with food you can’t eat right away. And if you made something you really didn’t like, better to compost it right away than stick it in the fridge for weeks, only to have to throw it out later. Every time you open your refrigerator door, cold air from inside the refrigerator falls out (because cold air falls, and hot air rises), and warm air from the room takes its place. Fortunately, most of the heat extracted from your fridge by the compressor is extracted from the foods themselves – solids and liquids have a much higher thermal storage capacity than air. That’s why the pickle jar stays cold even if you hold the fridge open for a full minute looking for that jar of marmalade, even if the air in the fridge turns warm. Unfortunately, though, the warm air that enters when you leave the fridge open translates into a lot of extra work for the compressor, which has to remove the warmth as well as the humidity brought in with the air from the room. So it’s best to organize your fridge to minimize time spent looking for things. 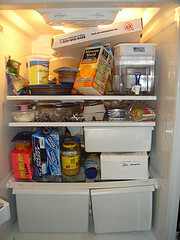 Think of the items you or your family most often look for in the fridge. In my house, milk, butter, fruit juice, and ketchup top the list. The milk is always on the bottom shelf, beside the unhinged side of the door, so that we can pull it out without opening the fridge fully. The butter is always in the butter drawer, so we can find it easily. The fruit juice is in the bottom rack of the door, again on the unhinged side, so we can pull it out after just opening the door a crack. And the ketchup is above the juice, on the outside end of the top door rack. Fruit, which the kids grab several times daily for snacks, is stored in the drawer on the unhinged side, while greens, which we pull out only for dinner, are on the hinged side. On the other hand, the hoisin sauce, which we use only once a week at most, is a bit hard to get to, and the Japanese miso we use once or twice a year is safely hidden right at the back. This isn’t rocket science. You just need to think about how you use your own fridge, and organize it so that you can reach the things you use frequently while opening the door as little as possible, for as short a time as possible. Maybe add a bit more food? 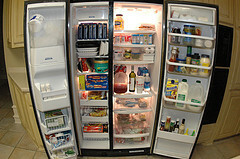 You might think that the more food you refrigerate, the more energy you use. In fact the reverse is true, up to a point: the fuller the fridge, the more efficiently it runs. Why? Because when you open the fridge, the cold air falls out and warm air from the room takes its place, and the fuller the fridge, the less air there is to fall out. This is why many people recommend adding empty or water-filled containers such as milk jugs or 2-liter soft drink bottles to your fridge if it’s not very full. Water-filled containers have two advantages: they are less likely to topple as you reach around them (but generally, you would put these closer to the back of the fridge than the foods you actually need to access); and in the event of a power outage, they act as heat sinks, keeping the food cold longer. However, don’t overfill your fridge with empty or water-filled containers, or you’ll decrease energy efficiency in two ways. First, if the fridge is too crowded, you’ll reduce air circulation within the fridge, which may cause some areas to get too cold (potentially freezing perishables such as eggs or greens). Second, you’ll increase the time it takes you to find the foods you’re looking for. The same rule about overfilling applies to food as well as to the empty containers you use to take up space: don’t overfill! A well-stocked fridge doesn’t mean one that is so crowded that you have to take a third of the contents out every time you are looking for something. Here’s a scenario you might have seen in someone’s kitchen – or done yourself if you’re not paying attention to your refrigerator’s energy use. Suppose you’re cooking a pizza from store-bought pizza dough, cheese, pepperoni, mushrooms and green peppers. You open the fridge to get out the dough. Close the fridge, and roll out the dough. Open the fridge to get out the half-used bottle of tomato sauce from the last time you made pizza. Close the fridge, and spread the sauce. Open the fridge to get out the mushrooms. Close the fridge, wash, dry, and slice the mushrooms, and spread them on the pizza. Open the fridge to get out the green peppers… You get the picture. You can make this pizza opening the fridge once for each ingredient (or twice, for ingredients you have to put back, like the tomato sauce or block of mozzarella). Or you can open the fridge once at the start, get out everything you’ll need, work with it, and then put everything back once you’re done. The same applies when cleaning up after a meal, or when putting newly bought groceries in the fridge. I always stack the jam jars, milk, butter, and other breakfast foods on the counter by the fridge, and then open the fridge just once to put them all back. (Doing it all at once also helps you keep the fridge organized). 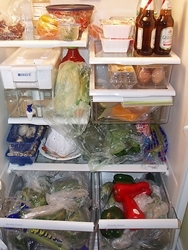 When the groceries come home, we keep the fridge and freezer closed, put the non-perishables away in cupboards or on the counter, and create two piles for fridge and freezer food; once all the bags are empty, we open the fridge and freezer (one at a time) and pack them with what goes in them. That’s far more efficient than opening and closing the door once for each ingredient you brought home. Another way to save is to not refrigerate things that don’t need to be refrigerated, especially if they are items you use frequently. For example, my 6-year-old son has learned to cook himself scrambled eggs, and on weekends or in the summer he is liable to pull out a fry pan at any hour of the day and throw together a batch. Since we moved to Costa Rica six months ago, we noticed that eggs are sold unrefrigerated, and in the houses we’ve visited here, nobody puts their eggs in the fridge. So we do the same now; the eggs are left out, and my son can cook his snack with one less thing to pull out of the fridge (he does still need to pull out the butter and milk). One thing to bear in mind is that until the 1950’s, electric refrigerators were a luxury item in most of the developed world, and they still are in much of the developing world. Many foods that we modern folk are convinced need to be refrigerated don’t really need to be, because they were invented in order to prevent spoilage. This includes foods such as cheese, yogurt, jam, cured meats, and salted fish, but the list is much longer. Eggs – can be kept unrefrigerated for at least a few days, as our ancestors did all over the world for thousands of years before energy saving refrigerators. Cheeses: buy a cheese bell, and leave some snacking cheese under it, such as old cheddar, or brie or camembert; these cheese taste better at room temperature, and will keep several days unrefrigerated. I have gone on canoe trips and kept old cheddar, unrefrigerated, for ten days or more without spoilage. Butter can be left out in a butter dish for toast, sandwiches, and frying. The butter will soften but if used within a couple of days of being taken from the fridge, it doesn’t spoil. Whole-grain breads are sometimes refrigerated to preserve the essential oils in the bread. But refrigerating these breads can make them turn tough, because of a process called retrogradation, in which changes to the structure of the starches alters the bread’s texture. Cakes and many other baked goods don’t need to be refrigerated. Potatoes, sweet potatoes, yams, and onions should not be refrigerated; instead keep them in a cool, dark place. Bananas and tomatoes degrade when refrigerated. Keep them on the counter. Mustards and even store-bought mayonnaise do not need to be refrigerated, although some hot mustards may lose some of their heat if left out a long time after opening. Ketchup can be left out as long as it does not get too hot and is consumed within a few weeks. If your family goes through a bottle a month you should be fine, but don’t leave the 2 liter behemoth on the counter all summer. Vinegar should not be refrigerated. Vinegar is a preservative, and any food containing a large concentration of vinegar doesn’t need to be refrigerated either. Pickles can last several days unrefrigerated because of the vinegar they are preserved in. Regular soy sauce, another preservative heavy in salt, does not need refrigeration. Reduced-sodium soy sauce may require refrigeration. Molasses does not require refrigeration. Although it is a ‘liquid’ sugar, the sugar in it is too concentrated for microorganisms to survive and proliferate. Only cold-pressed oils containing essential fatty acids should be refrigerated. This includes most nut oils as well as Omega 3 oils such as flax and hemp seed oil, and any expeller-pressed safflower, sunflower, or other ‘natural’ vegetable oils. Commercial brands of oil, including all types of olive oil as well as canola, corn, soy, and mixtures thereof should not be refrigerated. Meat-free leftovers you plan to eat within the next twelve hours probably don’t need to be refrigerated, unless they are likely to wilt. We routinely leave out dinner leftovers such as rice casseroles, pasta dishes, soups, scalloped potatoes and the like, then pack a lunch for the next day, and never once do the leftovers go into the refrigerator. As long as the lunch gets eaten on time, there’s no risk of spoilage. Milk past its best before date is safe to drink if it tastes all right. Yogurt can last for weeks past its best before date. Bread and other baked goods (but throw out the entire item if there are signs of mold). Finally, let’s review a few bad habits that can increase the energy use of even the most energy saving refrigerators, and that are really wasteful. Putting hot foods into the fridge to cool them: Energy saving refrigerators work hard to remove heat from inside compartments. Obviously, putting in hot foods in a fridge means more work for the compressor. It’s far more energy efficient to let hot foods cool to room temperature outside energy saving refrigerators, and only then transfer them inside. It is very unlikely a food will spoil in the hour or so it takes to cool it from boiling to room temperature. This applies to many leftovers as well – you don’t have to refrigerate them right away. Let them cool down first. Doing the ‘fridge stare’: If you’re hungry but not sure what to eat, or you’re getting ready to cook dinner but you’re not sure what to cook, there’s a good way and a bad way to solve your problem. The bad way, which my kids still aren’t cured of, is to open the fridge and stare blankly at the contents for a long while, until you’ve decided what you want. I’ve seen fridges left open for two minutes or more while someone considers their options. In the meantime, all that cold air has fallen out and warm air and humidity have gone in to give the compressor more of a workout. The good way is to think, before you open the fridge, what items in the fridge might conceivably meet your needs, then open the fridge, quickly locate each one, and take it out. If you don’t know what’s in the fridge (see the ‘Fridge organization’ section above for cures to that), at the very least, open the fridge, take a quick mental photograph of the contents of each drawer, the door shelves, and the main compartment shelves, shut the fridge, and think. Then, once you know what you need, open the fridge, take it all out, and shut the fridge. 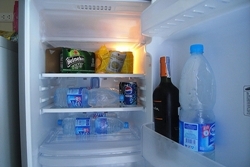 Using the fridge as an air conditioner: It feels great to open the fridge on a hot summer day. All that cold air falling out cools your body. But believe it or not, it actually warms your house. Why? Because for every bit of cold air you get out of your fridge, the compressor has to work to extract an equal amount of heat out of the fridge later, and at the same time the compressor and the motion of the refrigerant through the cooling cycle both produce friction, which become heat. So while the room feels colder for a few seconds as you leave the door open, you are actually increasing the cooling load on both the refrigerator and your air conditioner. You lose twice over. Delegating decisions to the fridge: I’ve covered this already in different terms, but it bears repeating: don’t delegate to your refrigerator any decisions about whether the leftovers from a meal, or a questionable foodstuff, is worth keeping. The delegation works like this: You made a ham salad, or cabbage rolls, or baked potatoes, that weren’t as good as you expected. You put them in the fridge, even though you’re relatively sure that since people didn’t like them to start with, no one will be tempted by them later. They stay there for a week, or two, or three, until you can throw them out without guilt because they have gone bad. If you know no one will ever eat it, just compost it or throw it out without ever sticking it in the fridge! All refrigerators sold on the North American market, and most sold in other developed-world countries, are energy saving refrigerators compared to almost every fridge that is five years old or more. Efficiency requirements keep rising, and for any given size of fridge, if you replace an older model with a brand new one, you will probably save energy. If you replace an older model with an equivalent ENERGY STAR model, you will save even more. No freezer compartment. These are often the msot efficient units. Freezer compartment inside the fridge. Typical in small or inexpensive units. Top-freezer compartment. 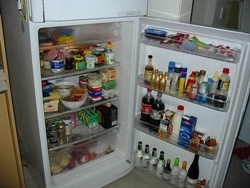 Most older and many newer fridges are in this configuration. Bottom-freezer compartment. The freezer compartment is typically larger than that in top freezers, and these units are more efficient than top freezer compartments because cold air falls. Side-by-side units, generally less efficient than either top- or bottom-freezer compartments. 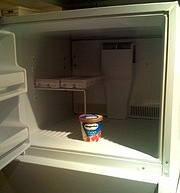 Most people don’t want the inconvenience of not having a freezer compartment, but if you do have a chest freezer and it is in a room easily accessed from your kitchen, you can save energy by buying a fridge with no freezer compartment, and storing all your frozen foods in your chest freezer. We did this for ten years – and our 1997-vintage, 17 cubic foot refrigerator, and our 10 cubic foot freezer, together used only 700 kilowatt hours of electricity a year. At the time, that was better than most 15 cubic foot fridge/freezer combinations, and even by today’s standards is very efficient. Before buying a fridge, think hard about your requirements. And think about what really needs to be refrigerated. You might think there’s no energy wasted in keeping your eggs, mustard, jam, soy sauce, and other non-perishables in the fridge if you have the space. But the more space you use for your refrigerator, the more energy you’ll use; a bigger fridge naturally requires more energy to operate, all other things being equal, than a smaller fridge. It’s easy to get caught in the salesperson’s trap of treating yourself to extra features. “This 15 cubic foot fridge is the same price as that 13 cubic foot fridge over there. All that extra space for the same money. And they’re both ENERGY STAR rated, so they’re both energy saving refrigerators.” But the ENERGY STAR ratings are based on capacity, and you will almost certainly use more energy with the larger than the smaller fridge. Challenge yourself to downsize. People’s tendency, unless there’s a limit to the space where their fridge slides in, is to always buy at least as big a fridge as they had before. It can’t hurt to have more capacity, can it? Well, it can hurt you in terms of your electricity bill, and if you’re eager to save every last kilowatt hour, then go slightly smaller rather than slightly bigger, given a choice between two energy saving refrigerators. ENERGY STAR is better, right? All other things being equal – meaning, you are considering two energy saving refrigerators with the same configuration, the same refrigerant, and the same volume – it’s better, from an energy point of view, to buy the ENERGY STAR rated refrigerator. But remember that an ENERGY STAR rating for a refrigerator means that that refrigerator is at least 20% more efficient than the minimum required standard for its class. And it is certainly possible for there to be two refrigerators of slightly different capacity or configuration, in which the one that uses more energy is ENERGY STAR logoed, while the one that uses less energy is not. 15-16.9 cubic feet: 480 kwh/year or less. Now suppose you are comparing a 17+ cubic foot fridge, ENERGY STAR logoed, that was rated at 530 kwh/year, with a 16.5 cubic foot fridge rated at 500 kwh per year. The first is ENERGY STAR logoed because it falls below that 536 kwh/year requirement for the larger fridge. Yet it uses more energy than the 500 kwh per year smaller fridge. ENERGY STAR products are meant to help you make energy-smart decisions, but simply buying an ENERGY STAR product is no substitute for reading the fine print. Make sure you check the Energy Guide or EnerGuide consumption for any fridge you are considering, and try to find the one that meets your capacity and feature requirements while using the least energy. Ideally, you will want to consider energy saving refrigerators that meet your capacity and feature requirements while using the least amount of energy, and that are within your budget. Remember that buying the most energy efficient refrigerator possible not only helps you save energy, it helps send a message to manufacturers, that people are prepared to pay more up front for energy saving refrigerators in order to save energy later, and that we don’t want products that have a low entry price but a high operational cost. Most people tend to underestimate how much energy prices will increase, when they calculate the payback period on an energy saving investment. This is true even when they take the golden rule into account! IMPORTANT info to add about eggs – In the US the natural protective coating on eggs is washed off and that is why they must be kept refrigerated. In other places, the eggs are not washed prior to distribution – so it is safe to keep them out. So, unless you buy your eggs outside the US, or personally havest them, you should not alow eggs to stay at room temperature for any length of time. Whether this unit saves energy depends on how you use it and whether or not it is properly sized for your needs, rather than on its actual consumption. All new refrigerators must meet stringent efficiency standards based on their capacity and type. Energy Star refrigerators have to beat those same efficiency standards by 10%. Most Energy Star rated refrigerators beat the standard by little more than the required 10%. So there is a pretty narrow gap between the least and most efficient refrigerators in a particular class, if you exclude a small number of extremely efficient refrigerators that are, for example, designed for the off-grid market. Since you have already bought the refrigerator, I imagine your main interest is in making use of it while using as little energy as possible. 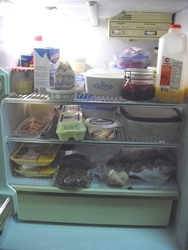 In that case the usual guidance applies: Make sure the fridge and freezer compartments are both set to the correct temperature (not to warm as food will spoil, not too cold as you will use more energy); minimize the number of times you open the doors, and the amount of time the doors are open each time; keep the fridge relatively full but not so full that it takes forever to find things; don’t put hot food in the fridge; don’t put open containers of food in the fridge; and so on. This page has plenty of guidance on how to minimize energy use of your fridge, take a look there and add another comment if something isn’t clear.